We offer a limited number of 12-month long internships, in various departments, based at our Sanctuary in Cornwall, UK. 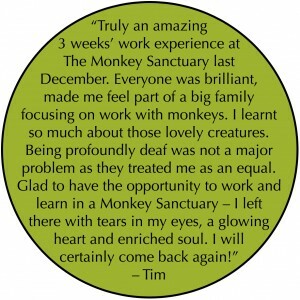 Our internships are an exciting opportunity to develop a wide range of skills, working alongside an experienced team, with the chance to earn a recommendation from a highly respected primate sanctuary. 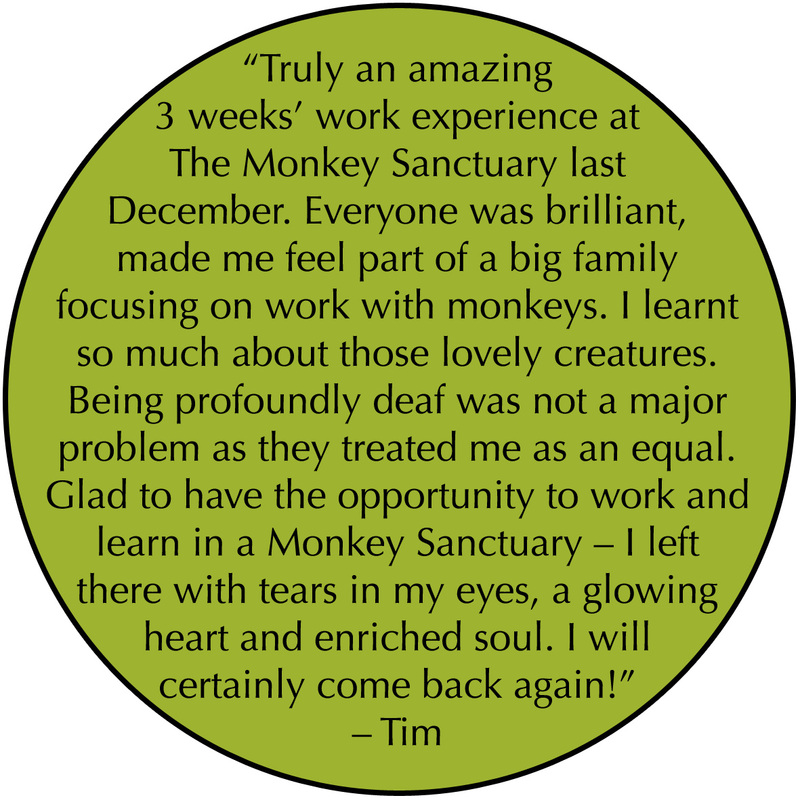 We have many different internships available in many different areas of the charity from Primate carer, Volunteer Coordinator to PR and Fundraising. For more information about our internships please contact info@wildfutures.org for more details. We are seeking a PR and Fundraising Administration Voluntary Internship to help assist the Wild Futures fundraising and PR team in managing the various PR and administration activities. This will include managing the Wild Futures and Monkey Sanctuary websites, coordinating press releases, planning social media activity, compiling monthly e-news and the newsletter. It also includes assisting on the administration for adoptions, general administration and answering the telephones. We have run this very successful and popular internship for 4 years, with participants either staying on to work for the charity or finding relevant work in the sector. Download a copy of the full job description below. "Friends of mine introduced me to the work of Wild Futures some time ago, and I am proud to be able to support their work through the ‘adopt a monkey’ scheme. The welfare and conservation work that Wild Futures’ undertake is both valuable and inspiring"